The rhyming peg mnemonic device, appropriate for learning an ordered set, is used to teach Mohs hardness scale. Students begin by learning the "pegs"—a set of words, each rhyming with a number from one to ten, to which each mineral will be linked. Students then study, interpret, make additional connections with, personalize, and visualize a set of illustrations that associates each mineral with its peg word, number, and attributes. This technique is effective because it is meaningful, helps students organize information, provides many associations, uses the creative thinking skill of visualization of images, and focuses student attention. The following poem contains couplets describing each of the ten mnemonic drawings. Rating talc as number one. Or a scratched-up pair of two. That the toothpaste labels "four." With an appetite for five! Beat a rhythm pounding six. Does a looping figure eight. Had red ruby roses nine. Gets a perfect score of "10"! The Minorities in Marine Science Undergraduate Program (MIMSUP) is an academic program at Western Washington University's Shannon Point Marine Center (SPMC) that seeks to increase the representation of minority individuals in the marine sciences. For the past 13 years, groups of students have spent two 10-week quarters at SPMC studying marine science, doing independent research, and developing the skills needed for success as marine scientists/educators. Program elements include formal coursework in marine science, supervised independent research, training in up-to-date field and laboratory investigative techniques, experience developing scientific and personal job-related skills, and introduction to the career options open to marine scientists. Results indicate that the program is impacting the career paths of student participants; program alumni seek advanced education and pursue careers in the marine and environmental sciences. MIMSUP introduces underrepresented students to the marine sciences, helps them develop greater confidence in their potential, and prepares them for successful careers in this field. In an effort to design a chemistry curriculum that serves the needs of geoscience majors, we at Washington and Lee have developed a new chemistry course entitled Chemistry of the Earth (Chemistry 110). This course is the first semester of a one-year chemistry requirement. The students then feed into the second course on aqueous chemistry. The course is intended to be a hands-on, geologically focused approach to teaching geologists chemistry. The laboratory uses geological examples of basic chemical principles and is largely field based using local geochemical examples. This team-taught introductory chemistry course also facilitates an interaction among the sciences. Details of the course are intended as a model for other universities undergoing similar curriculum reform or looking for new ways to teach geochemistry. The National Science Foundation Science and Technology Center at the University of Arizona sponsored a two-week workshop for science teachers. The overall goal of the workshop was to increase participants' hydrologic literacy by teaching issues and concepts concerning semi-arid hydrology in the Southwest, as defined by educators and scientists associated with Sustainability of semi-Arid Hydrology and Riparian Areas (SAHRA). It was designed to show teachers how to teach science content using a "science as inquiry" approach.There were three phases to the workshop: developing a need to know, acquiring conceptual knowledge, and applying newly acquired knowledge. Evaluations showed that teachers felt the pedagogical discussions following each activity were as important as the content they learned, and they recommended that more workshop time be spent for these conversations. These findings support the efficacy of the workshop design and they suggest revisions for future workshops. Information literacy (IL) is the set of skills that enables a person to find, evaluate, and use information. Although IL is important in the geosciences, it is hard to teach because the information comes in so many forms. Most geoscience courses include work that implicitly addresses some IL issues. However, because of the importance of IL, it is worthwhile to explicitly include it as part of the curriculum. The Association of College and Research Libraries has developed Information Literacy Standards for Higher Education that may be used to assess an individual's level of information literacy. We introduce a method for incorporating IL into the classroom experience by mapping an assignment to the ACRL standards. By using our method, an instructor, with or without the aid of a librarian, can easily implement IL in the classroom, providing both immediate and long-term benefits to the student. The Lifestyle Project is a way for students to learn about environmental alternatives by modifying their own lifestyles. It is a three-week exercise for students to reduce their impact on the environment by changing the way in which they live from day to day. The project has fairly rigid parameters, allowing students to achieve a gradual but definitive change in their everyday habits. Students choose three categories from a list of six: heat, garbage, electricity and water, driving, eating, and activism. They write about their experiences in journals, which are incredibly insightful, illustrating just how profoundly the project affects them. At the end of the project, students have had an experience that may be life altering, affecting not only the students themselves, but also their friends and families. We felt that we unexpectedly stumbled across a real solution to an environmental problem. The concept of the rock cycle and the "indefinite" length of geologic time were outlined first by James Hutton before he had ever seen an unconformity. Hutton drew general support of his theory from existing observations of unconformities from accounts in French, which he re-interpreted in light of his own ideas. Hutton then found his own field examples to test his ideas before coming upon Siccar Point. In summing up his evidence, which included wide-ranging observations on the geology of SE Scotland, Hutton himself did not cite Siccar Point. Inaccuracies concerning the role of Siccar Point in the development of James Hutton's ideas remain as entrenched as ever in many physical geology textbooks. A more balanced appraisal of all contributions to Hutton's work is warranted, particularly the contributions of French writers. Finally, an accurate presentation of Hutton's method can contribute to students' understanding of the nature of historical theories and in meeting the challenges of creationists. The topic of ground-water modeling is introduced through a web-based lesson. The curriculum guides students through the development of a conceptual hydrogeologic model, construction of a numerical flow model, and calibration of the numerical model to measured data. Students model a real watershed using actual hydrologic data. Parts of the model development and calibration are conducted in a virtual three-dimensional environment based upon Virtual Reality Modeling Language (VRML) technology. Solutions from the industry-standard MODFLOW program are used, but the model is never actually run by the students. Modeling results are pre-generated so that experience with numerical modeling can be acquired without the frustrations inherent in operating the actual software. The lesson is intended to offer a more intuitive experience with ground-water flow modeling than attained through off-the-shelf ground-water software or lecture-based instruction. Encyclopedias, especially those focusing on a single subject or narrow range of topics, are important but underused library resources. Encyclopedic consultation is often viewed as an academic weakness. It can, however, be viewed as an academic strength and effectively incorporated into instructional programs. Since this article is written from a librarian's perspective, it is not suggestive of specific instructional techniques. Instead, it addresses the difficulties that can arise in identifying titles appropriate for instructional purposes. Using a combination of methods, a list was derived of approximately 250 geoscience related encyclopedias that are available in North American libraries. We have developed a home energy conservation exercise that illustrates the ways in which heat energy is lost from a home and ultimately, how it can be conserved. Students are asked to calculate the heat loss from a model home before and after applying energy conserving modifications. The difference in these calculations represents the amount of heat energy that could be conserved by making the modifications. To calculate total heat loss for each version of the home, students must account for convection, (heat transfer via air movement), and conduction, (heat transfer through solid materials). Students are provided with a list of building material costs and a budget of $5,000 and are asked to retrofit the un-insulated home in such a way as to conserve the maximum amount of energy and heating cost per heating month. 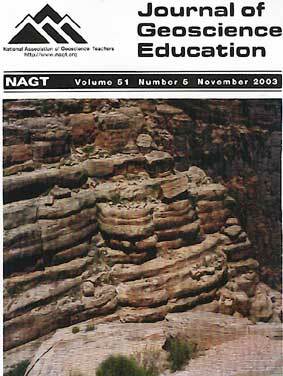 Introductory geology courses commonly include material on resources, energy, and the environment. Current news topics include discussion of the energy resources in the Artic National Wildlife Refuge and the shortage of natural gas. This exercise takes a practical approach to energy conservation and applies it directly to conservation of a geological resource. When used in conjunction with classroom discussions concerning the detrimental effects of the use of fossil fuels and their limited supply, it is an effective way of demonstrating the concept of conservation as a source of energy and a means to preserve the environment. It is also a practical way to incorporate quantitative reasoning into the classroom. As Native Americans gain increasing control and autonomy over their lands, the lack of scientific expertise in these communities and the low representation of Native American students in science programs become more urgent problems. This is especially true in the Earth and environmental sciences because of the many resource and land management issues faced by tribal groups. Many regional programs exist to develop culturally-appropriate curricula for Native American students, but none exist which serve the Native Americans of Southern California, and few of these programs also focus on the education of non-Indian geoscience professionals who work on or near Native American lands. We present results from a qualitative study based on inaugural meetings of the Indigenous Earth Sciences Project where professional geoscientists and tribal representatives gathered to exchange scientific and Native American views of regional geology and Earth science education for American Indian communities. Major themes which emerged from analysis of written comments collected from participants after the conferences revealed a sense of the legitimate possibilities for constructively incorporating indigenous knowledge into Euro-American geoscientific knowledge. Much of this stemmed from new exposure to indigenous world-views and also underscored a need to bring more Native Americans into the study and practice of the Earth sciences. The meetings have also formed the basis for development of Earth science education programs for Native American communities and an increase in the prominence of issues relating to Native Americans in the professional geoscience community. IDnet Commentary and Proposed Revisions to Kansas Education Standards, Sixth Draft of Science Writing Team - December, 2000.